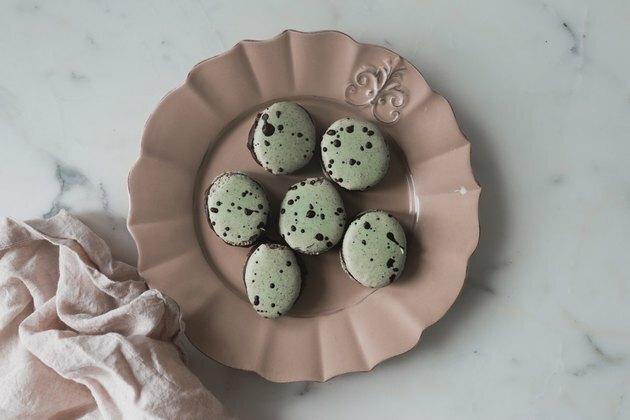 These speckled egg macarons make for a fun and delicious chocolate-y treat this Easter! 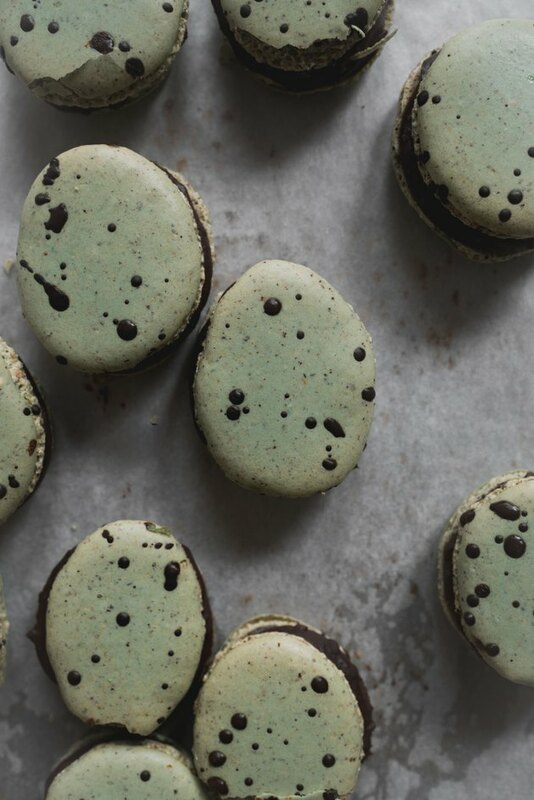 The hazelnut macarons are light and crisp on the outside, chewy in the middle, and filled decadently with dark chocolate ganache. They are delicious and the recipe couldn't be any simpler. Make them this Easter! Pre-heat the oven to 375 degrees Fahrenheit (190 degrees Celsius). 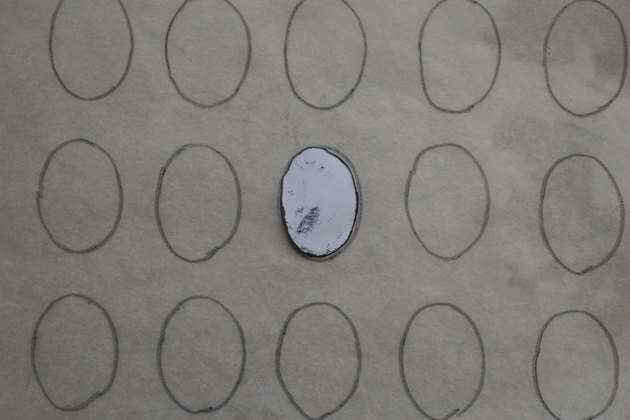 Draw a 1 1/2 inch (3.8 centimetre) egg shape on a piece of paper. Cut this shape out and use it as a stencil for your easter egg shaped macarons. Trace this shape over three sheets of non-stick parchment paper, spacing them about 1 1/2 inch's (3.8 centimetre's) apart. You should have about 60 little egg stencils, which will make about 30 filled macarons. Flip the pieces of parchment paper over so the drawn side faces the bottom and place the paper on three separate baking sheets. Set aside. 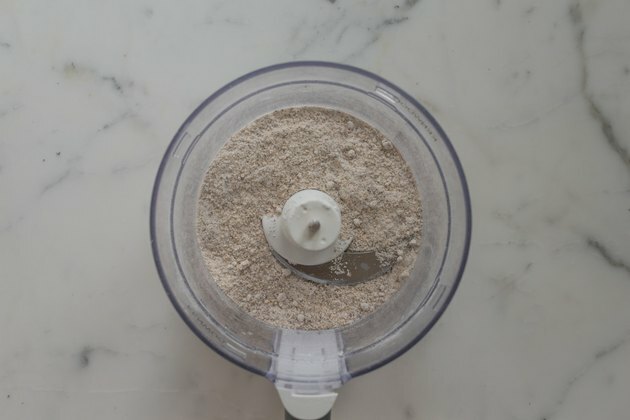 In the bowl of a food processor, pulse the hazelnut flour and confectioners' sugar to form a fine mixture, about 1 minute. Sift the mixture into a separate bowl then set aside. 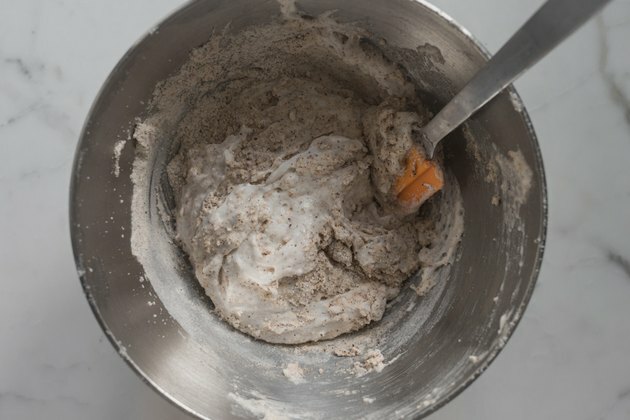 In the bowl of a stand mixer fitted with the whisk attachment, or using a handheld electric whisk with a large bowl, whisk the egg whites on medium speed until foamy. Add in the granulated sugar, a little at a time, until it is all incorporated. Increase the mixer speed to medium-high and continue to whisk until the mixture forms a stiff and glossy meringue, about 7 more minutes. Remove the bowl from the stand mixer. Sift half the dry flour ingredients over the meringue. Use a large rubber spatula to fold until just combined. Then sift over the remaining half and fold until evenly combined. Add in a few drops of the food coloring. Fold until evenly combined throughout the mixture. Transfer the mixture to a piping bag fitted with a small and round tip. Pipe the mixture onto the sheets with the easter egg stencils. Tap the baking sheets against the kitchen bench to release any trapped air bubbles. 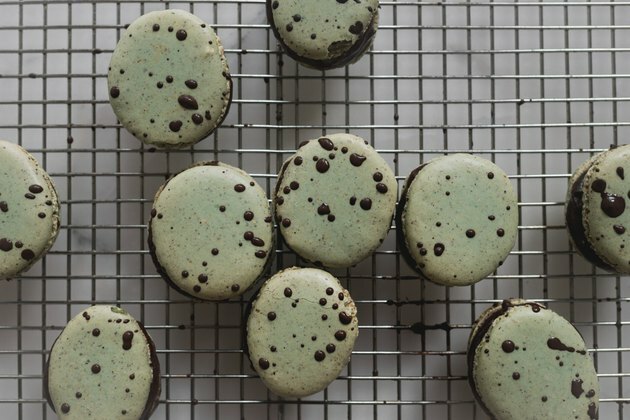 Let the macarons stand at room temperature for 15 minutes. Lower the oven temperature to 325 degrees Fahrenheit (160 degrees Celsius). 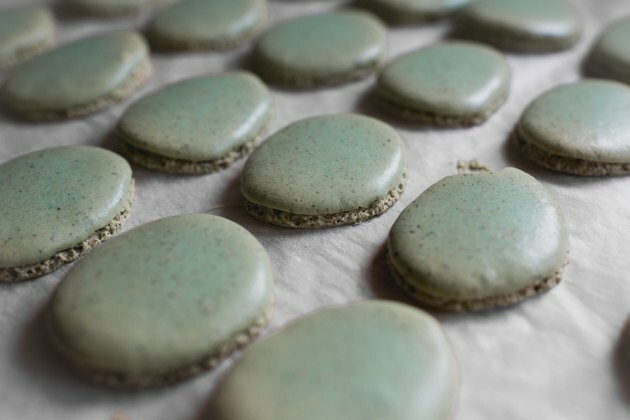 Bake the macarons a sheet at a time for 12 to 15 minutes, or until crisp and firm. Make sure to rotate halfway through baking. Remove from the oven. 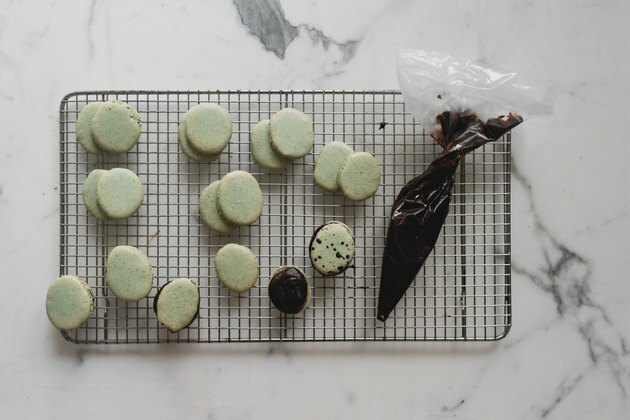 Set aside until the macarons are completely cool before carefully removing from the parchment paper and filling. Place the dark chocolate into a medium sized bowl. Set aside. Pour the heavy cream into a small saucepan set over medium heat. Heat, stirring often, until the cream reaches a consistent rolling boil. Remove from the heat and pour the cream all over the chocolate. Let the mixture stand for 1 minute to acclimatize, then, use a rubber spatula to stir until completely smooth. 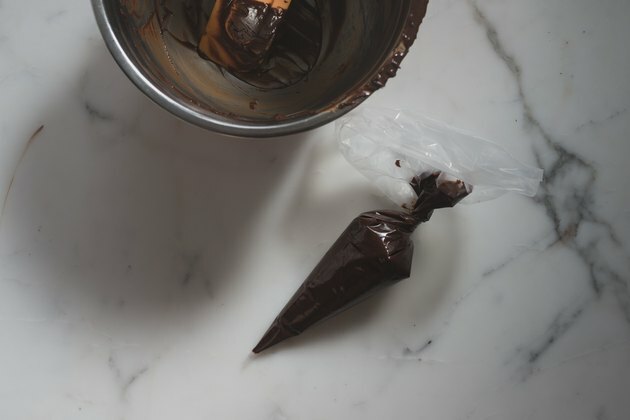 Let the ganache sit at room temperature to cool slightly for 10 minutes, then, place it into a piping bag. Match one macaron shell to another shell of similar size. Pipe a little of the dark chocolate ganache onto the flat side of one of the macaron pairs. Use a small amount of pressure to carefully press both macarons together to form a little sandwich. Repeat with the remaining macarons. Once filled, place them in the refrigerator to firm slightly whilst you prepare the speckled decoration. 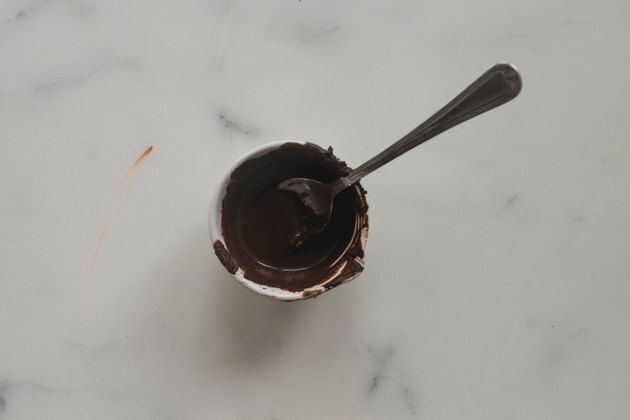 In a small bowl, combine the dutch processed cocoa powder and water to form a smooth paste. Remove the macarons from the refrigerator. Use a teaspoon to splatter the cocoa mixture across the tops of the shells to form a 'speckled' effect. Let stand for 15 minutes, or until the decoration has set. Serve and enjoy your Easter Egg Macarons! They are best eaten on the day of making but can be stored in an airtight container in the refrigerator for up to 3 days. You can freeze and seal any un-filled shells for up to 3 months and fill when desired.